I love risotto! It’s quick and oh-so-easy to make…and did I mention it costs pence to make? A big pan of risotto will make a handsome and delicious evening meal for four people or serves ample portions for two with cold leftovers thrown in containers for tomorrow’s lunch. 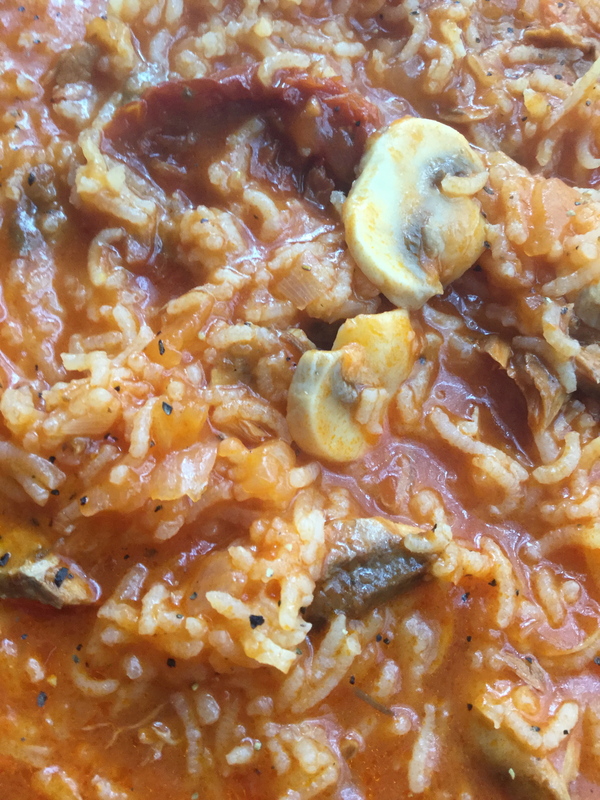 Originating in Northern Italy, this rice cooked in a broth dish can consist of anything you have in: from fish (fresh, frozen or canned, any variety suits this dish), through to meats of any description and then on to vegetarian versions. This truly is a dish of variation – and you can concoct any variety you happen to have the ingredients for. Here, I’m creating a tangy fish, tomatoes and mushrooms version. And for those following gluten free and dairy free diets this simple, traditional Italian starter dish makes a very delicious meal that won’t inflame any food intolerances*. Usually a high starch white, round rice is used with one such example being Arborio rice. In this instance, and being mindful that rices such as Arborio can be relatively high priced, I tend to use a cheap “basics” white rice, having thoroughly washed it beforehand in salted water and then numerous rinses to make sure it is clean before cooking with it. In a large frying pan, heat the oil until it starts to spit on a medium heat. While the oil is heating, make the vegetable stock as per the instructions of the stock cubes you are using. Set aside. Next, add the onion and cook for about 5 minutes until it begins to look opaque in appearance. Now add the rice and swirl the rice around and into the chopped onion and oil. If need be and to stop the ingredients from sticking to the pan, add a little more oil or a splash of boiling water. Fry the ingredients for a few minutes until all are covered in the glistening oily liquid. Turning the heat down to a low simmer, add the mushrooms, tomatoes and mackerel, and stir these into the onion and rice mixture. The tomato puree can be added now, too. You are now ready to start to add the vegetable stock a little a ladle at a time. Stir the ingredients regularly so as to enable the rice to absorb the stock and when the stock looks to be absorbed, add more of it. Keep this going until all of the stock is used. You are aiming to achieve a thick broth-like consistency for the final look of the dish. Once this broth-like consistency is reached, the rice should be cooked. Taste it: is it cooked? If not, add a little more liquid as you’ve used the stock by now by simply adding a little boiling water and cook until the rice is cooked. Cooking time will depend upon the rice you are using so check the packet instructions for the timing. Serve on warmed dinner plates or in bowls, and season. I used rice that cooked in 10 minutes which made this a super quick meal to make. And as the rice was from a “basics” range, it was extremely affordable, too. And you can quite literally use any combination of ingredients when making a risotto: I’ll be bringing you a few more such examples soon. * Do check the food labels to make sure you are fully aware of what each ingredient includes before using it within your recipe.